Do you remember those giant parachutes you used to play with during recess or at summer camp? There were different games you could play with them– cat and mouse, popcorn, or sharks and minnows– but the best game was played simply when everyone grabbed a handle, raised the parachute into the air, and then ran underneath it and sat inside, creating a giant bubble-like clubhouse. Imagine playing with twelve of those parachutes, which were once white but have now collected pictures and messages from all over the country! Cloud Preaser, an art collective providing public and participatory art, are behind these playful and creative parachutes! 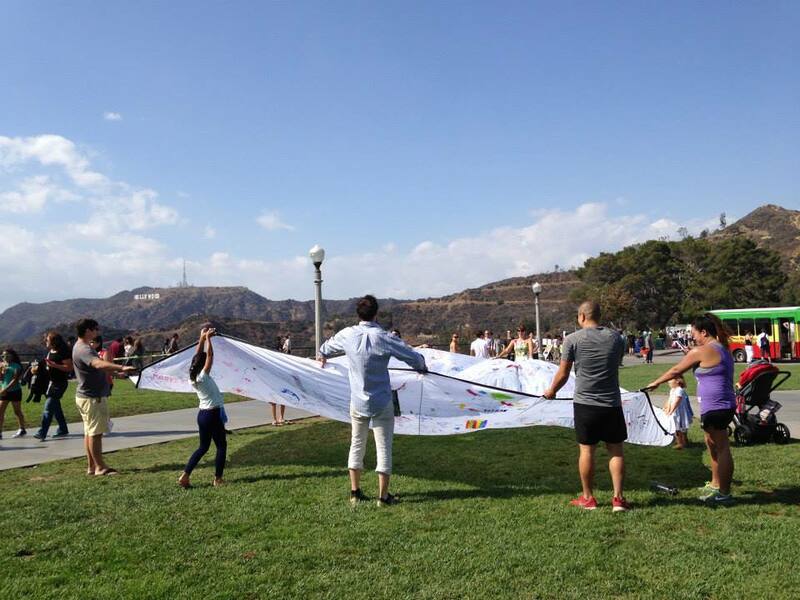 In 2014, they traveled all over the United States and invited hundreds of strangers to play with, add pictures, messages, thoughts, and other positive, creative energy to their parachutes. Now, they are coming to Spark Monument Circle to share more of the fun!